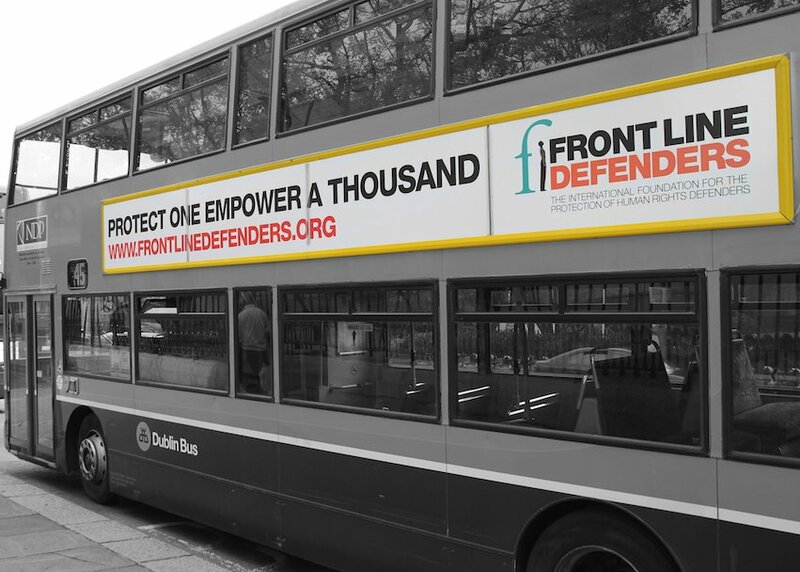 Front Line Defenders was founded in Dublin in 2001 with the specific aim of protecting human rights defenders at risk (HRDs), people who work, non-violently, for any or all of the rights enshrined in the Universal Declaration of Human Rights(UDHR). Front Line Defenders addresses the protection needs identified by HRDs themselves. Front Line Defenders maintains its headquarters in Dublin, an EU Office in Brussels, and regionally-based field staff in the Americas, Asia, Africa and the Middle East. an emergency 24-hour phone line for human rights defenders operating in Arabic, English, French, Russian and Spanish. In emergency situations Front Line Defenders can facilitate temporary relocation of human rights defenders. Front Line Defenders promotes strengthened international and regional measures to protect human rights defenders through support for the work of the UN Special Rapporteur on the Situation of Human Rights Defenders. Support for the office of the Special Rapporteur is also made through the Frank Jennings Internship Programme. Front Line Defenders promotes respect for the UN Declaration on Human Rights Defenders. Front Line Defenders has Special Consultative Status with the Economic and Social Council of the United Nations. Front Line Defenders has partnership status with the Council of Europe. Front Line Defenders has Observer Status with the African Commission on Human and Peoples' Rights, and supports the work of the Special Rapporteur for Human Rights Defenders at the African Commission on Human and Peoples' Rights by providing an intern on an annual basis. Front Line, The International Foundation for the Protection of Human Rights Defenders trading as Front Line Defenders, is registered in Ireland as a company limited by guarantee and not having a share capital (Company No. 593190; Registered Charity No. 20045241; CHY 14029). Registered Office: Second Floor, Grattan House, Temple Road, Blackrock, Co Dublin, Ireland. In 2007 Front Line Defenders was awarded the King Baudouin International Development Prize, "for the effectiveness of their efforts to combat the isolation faced by human rights defenders around the world, for the support and protection that they offer them, and for their continuing advocacy in favour of an international plan of action for human rights, which is an essential condition for development". In 2018, Front Line Defenders was named one of 100 Sparks of Hope to commemorate the 100th anniversary of the birth of Nelson Mandela by The Elders, as part of its #WalkTogether campaign. #WalkTogether exists as a platform for celebrating freedoms and building a bright map of hope, highlighting those who share our mission: to shine a light on courageous moral leadership and offering hope around the world where it's needed most. Front Line Defenders serves as the lead partner in ProtectDefenders.eu - the European Union Human Rights Defenders mechanism, established to protect defenders at high risk and facing the most difficult situations worldwide. It is a consortium of 12 international and regional human rights organisations which collectively implement the European Human Rights Mechanism. Front Line Defenders provides rapid Security Grant support to human rights defenders in partnership with the Lifeline Embattled CSO Assistance Fund. Front Line Defenders is also a member of the Women Human Rights Defenders International Coalition, ESCRNet – the International Network for Economic, Social & Cultural Rights, and the International Human Rights Funders Group. Front Line Defenders is a member of the Journalists in Distress (JID) Network, a group of 18 international organizations that provide direct assistance to journalists and media workers whose lives or careers are threatened because of their work. el presente informe forma parte del memorial de defensores y defensoras de derechos humanos.